As Words Alive joins the nation in celebrating Volunteer Appreciation during the month of April, we thank the volunteer core that tirelessly devotes time and talent year-round to make our mission, and the work of many other organizations, possible. San Diego is a philanthropically active community, and Words Alive is one part of the call to action. 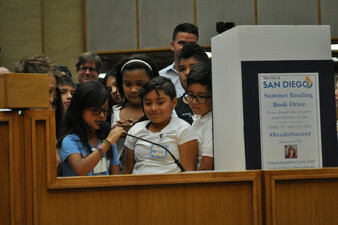 The University of San Diego’s Caster Family Center for Nonprofit and Philanthropic Research, a partner in Words Alive program evaluations, published their State of Nonprofits in San Diego report in 2014 that cited a total of 9,364 501(c)3 nonprofits in San Diego. 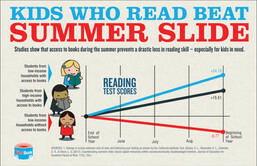 The nonprofits reported represent a variety of foci including but limited to education, health, environment and animals. Of the thousands of nonprofits reported, only 23% have paid employees – meaning the work of over 7,000 organizations is facilitated entirely by volunteer support. Of the few thousand nonprofits with paid staff, 59% have fewer than 10 employees (Words Alive included). The impact of San Diego’s volunteer community becomes clear – an enablement of thousands of charitable organizations to make their missions reality. We can attest to that: our core of 550 volunteers empowers us with the ability to reach 5,000 children, teens and families each month with our programs. Turns out, a culture of giving is not limited to San Diego. In 2014, the State of California had the highest number of reported volunteer hours in the nation. As if the time spent and the talent shared isn’t enough of a testament to the impact of volunteerism, the dollar value of each hour given is incredible. 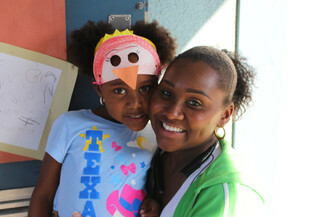 In the last year alone, Words Alive volunteers have contributed over 10,000 hours toward our mission. According to the Corporation for National & Community Service, each volunteer hour is attributed a monetary value of $26.87 (as of 2014). 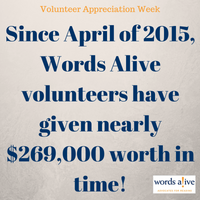 Since April of 2015, Words Alive volunteers have given nearly $269,000 worth in time! On behalf of every nonprofit in San Diego, thank you for your devoted and often thankless work to ensure that we remain an aware, progressive and giving community. You provide a model for the world of how your shared time and talent can bring such valued impact.